The incident, which occurred on July 7, 2017 involved an Air Canada passenger flight from Toronto to San Francisco. Flight AC759, with 140 aboard, was cleared to land at SFO runway 28R. However, the pilot incorrectly lined up his angle of approach and began to descend on Taxiway C instead. Thirty seconds into the video posted below, a white light, which is Flight AC759, is seen in the upper screen. The flight is shown descending. At the 1:07 timestamp, the plane is getting ready to descend on Taxiway C, and seconds later the plane is shown pulling up and circling around. ​The video footage released by the NTSB Wednesday as part of its continuing investigation of the incident shows Flight AC759 almost hitting four other planes filled with passengers sitting on Taxiway C waiting for flight clearance to take off. However, no one was injured in the narrowly avoided collision because air traffic controllers noticed the pilot's error and sent him on a "go-around." The video footage shows the Air Canada pilot pulling his plane up and circling around. The plane eventually landed safely, although this is not captured in the footage. 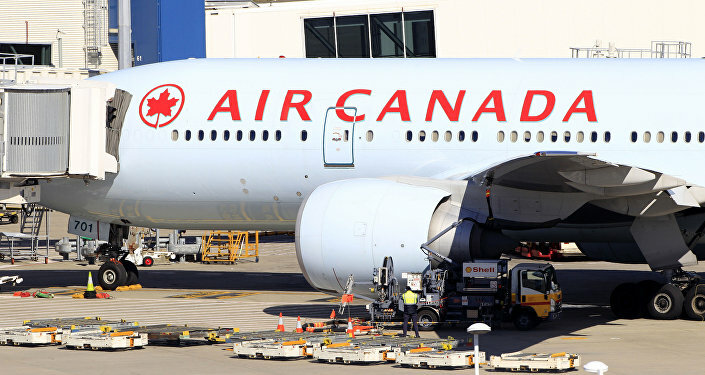 Following the incident, an Air Canada spokesperson released a statement stating that the airline was still "investigating the circumstances" of the incident. "If it is true, what happened probably came close to the greatest aviation disaster in history," Ross Aimer, the CEO of Aero Consulting Experts and former United Airlines Captain, told Mercury News after the near-miss. "If you could imagine an Airbus colliding with four passenger aircraft wide bodies, full of fuel and passengers, then you can imagine how horrific this could have been," he added.